I love Decovil 1! I use it in all my wallets as my preferred stabiliser. 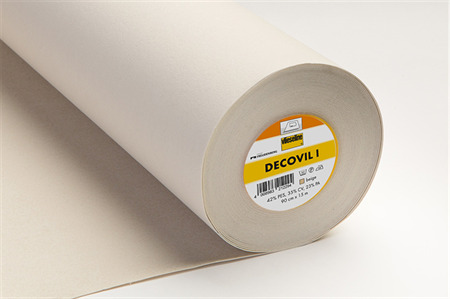 It is a non woven, fusible product that is flexible and when applied properly, doesn’t wrinkle. Yet it is sturdy so your wallet not only looks good, but feels professional as well! Decovil 1 doesn't tear, doesn't fray and you can sew right through it. Your wallets will still look as good as new even after months of use! If you haven't tried it before, this product comes highly recommended by ME for wallets! WOW! 90cm Wide. For different length cuts, please contact me! The Decovil 1 will be folded for shipping however I do recommend you roll it for storage even though the creases do come out. Then cover with a damp cloth and press the iron carefully for about 6 seconds, step by step each area.